Play on more than 300 slots, casino table and card games, but also with a live dealer. 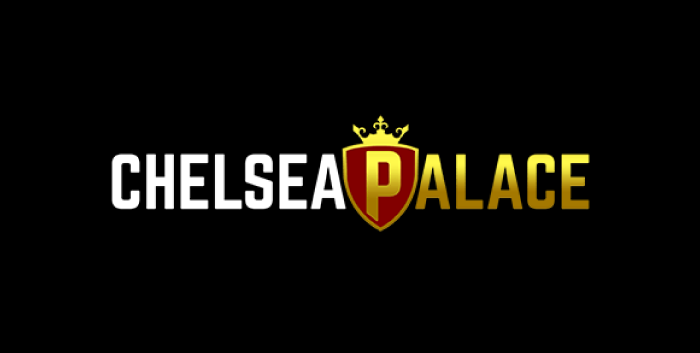 All of this is available with the Welcome Bonus that you can claim for Chelsea Palace right from this page. 'Chelsea' is a term that has so many popular connotation which are by all means respectable and reputable. The same is true for Chelsea Palace, the online casino that offers amazing welcome bonuses and has every single casino gaming category. Chelsea Palace is based in Gibraltar and enjoys a license from both the United Kingdom Gambling Commission as well as from the Gibraltar Gaming Commission. The casino runs on the famed Nektan platform, which is an industry bearer with scores of online slots and casino games, possibly in the thousands. The Chelsea Palace casino has selected the best, the most exciting and the most potentially rewarding online slots and casino table and card games in the world of e-gaming. What is more, the players can take all the fun at this casino on the go, so everything is in place here for a cutting-edge gaming experience for both pro and beginner players. The welcome package is available to new customers and is to the tune of £850 spread over three deposits. In addition to this amount, the players get 50 bonus spins on Starburst, and this is how the offer works. The first deposit gets a 200% match on the money and up to £100 in bonus funds plus the 50 spins. The second deposit is 100% match up to £250 and the third is 50% match up to £500 in bonus money. This is not the only promotion at Chelsea Palace casino, as there are always several things that the players can claim or participate in. For example, there are happy hours when players get a number spins for a small deposit; and cash prizes on certain days of the week or on the weekends; and there are occasional competitions. There are more than 250 online slots at the casino, and these are in addition to the table and card games. Chelsea Palace have the best new games, as well as classics, but also slots that haven't reached some significant popularity but are nevertheless fun to play. Some of the titles that we would single out are Cleopatra and Starburst as the most famed classics, Rainbow Jackpots, God of the Sea, Mystery Reels Megaways, the slot game that started the megaways popularity - Bonanza megaways, Finn and the Swirly Spin, Fishin' Frenzy slot, Action Bank and dozens of other online slots. As for the software developers, Chelsea Palace accepts slot games only from industry-bearers whose productions are audited and verified for fairness by independent auditing houses. These are companies such as Open Bet, NetEnt, NextGen, Playtech, Novomatic, Big Time Gaming, Red Tiger Gaming, Pariplay, International Game Technology, Aristocrat, Scientific Gaming, and so on. Chelsea Palace has dozens of casino games and this list starts with the basic games and then branches off in a flow chart that includes all of the variants. So the players eager to play table and card games will discover American roulette, European roulette, Blackjack professional series, Baccarat, Oasis poker, Pontoon, Punto Banco, Texas Hold'em, Blackjack Silver, Dreamcatcher wheels, Immersive roulette, and many other options. There is of course a Live Dealer parlor where the players can immerse themselves in a live casino gaming environment without traveling far to actually book a room and enter a casino resort. The live dealer games are playing against or with a real person - a welcome change of scenery after playing virtual casino games and slots, with perhaps the same or better thrill, but that depends on personal taste. Chelsea Palace has a long list of payment and withdrawal methods that are available to the customers. The first and foremost services, which are the industry standard around the world are PayPal, Visa, MasterCard and NETeller. There are alternatives also such as Boku, paysafecard, Skrill, Trustly and Zimpler. Usually the minimum deposit is £10 and the deposit time is anywhere from few minutes to an hour, but most likely few minutes. The same minimum amount is valid for withdrawals and the time to pull money into your account is between two and seven days. Nektan's gaming platform is fortified by the latest SSL security protocols which makes all transactions safe. Additionally, each of payment services have their own security infrastructure. As for the contact, the players can get in touch with Chelsea Palace through the contact information in the player's console. There is a 24 hour email service, telephone and live chat. If you are ready to play at Chelsea Palace casino, start your adventure by claiming the welcome bonus right here.